By the time I finished watching Werewolf of London, I couldn’t help but feeling that it is first and foremost an allegory on alcoholism. It certainly is not frightening or creepy, particularly when held up against other horror pictures of the same decade (Dracula, Frankenstein, etc.) It even lacks any identifiable atmosphere; instead, its tone is flat and literal. The story begins with two botanists – Dr. Wilfred Glendon and his assistant – on a journey to Tibet to collect a certain rare flower (“Marifasa Lupina”) that supposedly lives off of moonlight. During the trip, Glendon is attacked and bitten by a strange creature. Much later, after returning home to London, a mysterious man appears and tells Glendon that he is now a werewolf, and that the rare flower is the only antidote. But soon after I began to see a glimmer of something interesting. I realized that many of the women in the movie are drunks, with many joking references to their inability to discern reality from imagination. And what happens to Glendon (the werewolf) is very like the life of an alcoholic. 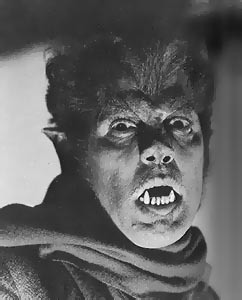 There is nothing different in his plight than many other movie werewolves: he first denies that he is a werewolf, then tries to hide it, then to control it (he locks himself up in a room with barred windows), then, in defeat (he cannot stop killing), he finds the desire to end it all rather than continue as he is. Yet juxtaposed with the emphasis on drunken characters, and the utterly isolated character of Glendon, this series of events appears to be nothing less than an analogy to addiction. The man loses control, his wife, his focus on his work, and then ultimately his life. A very interesting choice (perhaps fueled by budget as much as anything) was to keep the werewolf very much still human. He has fur and fangs, sure, but minus these things he is simply a man out of control with blood lust. After first turning into the wolf, he pauses to put on a coat and hat to conceal the change! He still walks like a normal person, and even makes an apologetic speech as he dies (as the wolf). He is still a man, yet he has lost control. Unfortunately, the movie is just not much fun to watch. There is little to no wit in most of the dialogue, amateurish makeup and an awfully dull romantic subplot between Glendon’s wife and her old boyfriend. And more importantly, a good werewolf has to be – if not frightening – at least a little unnerving. A bright spot is the performances of the two old sisters who rent the room to Glendon when he runs away from home (played by Ethel Griffies and Zeffie Tilbury). Their repartee and startled squawks are cause for a few smiles in the midst of the dreariness of the plot. This entry was posted on March 9, 2010 by Ian Kay. It was filed under Werewolf of London (1935) .